New review on the Carry Trainer YouTube Channel covering Vedder LightTuck and ProDraw holsters. Although this is the first dedicated video, we’ve been talking about the virtues of Vedder Holsters for a longtime so it’s no surprise they make great stuff. In Episode 3 of the Higher Line Podcast Mickey interviews athlete and combat veteran Eric Rainwater. It’s a powerful motivational story about the Indomitable Spirit…Recovering from catastrophic injuries and losing the love of your life unexpectedly at a young age. Eric Rainwater is a police officer outside New Orleans, Louisiana who’s been his share of firefights. Prior to becoming a cop Rainwater served in the navy as an explosive ordnance disposal technician attached to a SEAL unit. As a young man in the prime of his High School Basketball years, with ambitions to play professionally, Rainwater was run over by a truck in a tragic drunk driver accident. Doctors told Eric he’s never walk straight again, but with steel resolve he overcame the odds to recover his athletic abilities and play basketball through college. This noteworthy new video was made possible with by one of our S12 Event Sponsors. SUREFIRE is known for producing the best pistol lights on the market, but how do the different models stack up in real world testing? This video shows the differences between seven models in addition to Mickey’s everyday carry flashlight, the Surefire EDCL1-T. This episode is a behind the scenes discussion of awareness, mindset and much more from last years Carry Trainer class in Dover, Tennessee. Lots of valuable information for those that carry and fighters alike. Extra video footage is included with the YouTube version of the podcast. The Carry Trainer Higher Line Podcast is available on iTunes, Google Play, YouTube… and coming soon to now on Stitcher. 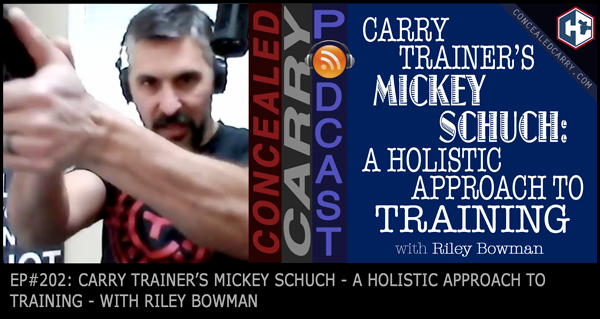 Carry Trainer Mickey Schuch is a guest on Episode #202 of the Concealed Carry podcast. Listen to it here. Mickey announces two spots from each Carry Trainer class this year will be donated to teachers. Are you a teacher?… then email training(at)carrytrainer.com for a chance to win. Less than a Week Left to Enter for S12 Event Drawing! To enter S12 go here now! In Episode #1 of the Higher Line podcast Carry Trainer Mickey Schuch and former Army Green Beret Zee Durham discuss the “Green Beret” mindset.